ESAD - SALVIATI 2011 from Liran V.H on Vimeo. The problem is that “place” itself is a constantly shifting term that is not confined merely to static physical geography. Recent scholarship on the concept of the global emphasizes that overarching, transnational movements are built through (and in turn inflect) local cultural agency. To study this mutuality, metaphors such as the network, the narrative, or the imagined community have been proffered. So have distinctive methodologies such as the micro-history, in which a person or object is used as a lens through which large-scale movement can be brought into focus. The writings of the postwar Marxist theorist Henri LeFevbre have been influential in this context. His project was to understand how place was a means through which capitalist modern culture produced and reproduced itself. The seemingly neutral medium that we traverse is, in LeFevbre’s account, always politicized, always filled with ideological content. We cannot help making space into place, and place makes us in turn. In light of such theoretical accounts, the certainty that one often encounters in discussions of craft’s rootedness seems badly in need of revision. This issue offers several contributions to that effort. We lead off with a short report by our own Digital Editor, Kevin Murray. 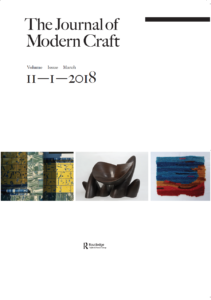 In past months, he has been building the Journal of Modern Craft website into a lively forum for scholarly exchange. His discussion here, in the same spirit, summarizes the results of a “south–south” conversation held in Chile recently, at which Australian, Asian and Latin American craft specialists convened. Murray’s probing consideration of this debate introduces themes that will reappear throughout this issue. As he suggests, being faithful to tradition is never easy, and sometimes not even preferable as a way of empowering “local” craftspeople. This issue’s articles by Lily Crowther and Suzette Wolfe Wilson show how the study of craft upsets our geographical instincts. Crowther argues that the early twentieth-century British studio craft movement found its most hospitable milieu not in the traditionrich rural landscape, or the innovative city center, but rather the much-despised suburbs. In her case study of Camberwell, a residential area of South London, the very characteristics for which craft is usually seen as an antidote—homogeneity, consumerism, and institutionalization—were precisely the variables that permitted studio practice to thrive. Wolfe Wilson’s study of contemporary activity in Jamaica shows us that craft is not necessarily compatible with a healthy relationship to an underdeveloped environment. “Traditional” making is not necessarily sustainable, as it exacts too great a toll on the island’s limited timber and mineral resources. She argues that it is only through an informed, globally aware strategy, in which local materials are used in a manner fully cognizant of the possibility of imported substitutes, that Jamaican craft can be rendered truly sensitive to its locality. Patricia Ribault’s Statement of Practice for this issue offers another method for studying craft and place: the technique of comparison. Though primarily a theorist, Ribault has a background as a glass blower, and has completed residencies around the world. Her article is a prime example of passionate argument drawn from direct experience. She juxtaposes three dramatically different situations in Italy, Afghanistan, Tunisia, all of which present their own challenges for glass production. Like Wolfe Wilson, she argues that even in the most hallowed craft sites, “tradition” cannot be regarded as sacred and inviolable. Curiously it is Sadika Kamoun, an artist and impresario working in Tunisia—where there is no recent history of glass-making to speak of—whom Ribault sees as having achieved the most successful relationship with her surroundings, through a creative mixing of techniques and tools picked up through her own global travels. The issue also includes several contributions that concern craft’s role within design practice. Often, in collaborations between designers and artisans, the latter are considered to provide local depth and authenticity. (The designer, presumably, provides cosmopolitan sophistication and knowledge of international markets.) Again, our authors suggest it is not always so simple. Both the innovative Droog Collective, who re-branded our concept of Dutch design in the early 1990s, and the contemporary “digital guilds” described by Amanda Parkes and Leonardo Bonnani, center on a more recursive relation between conceptualization and craft skill, in which the latter seems to be the most innovative element within the design process. This topic is also explored in depth in this issue’s Primary Text, an extensive survey of leading designers’ attitudes to craft circa 1959, taken from the pages of Zodiac magazine (an organ of the Italian product design firm Olivetti). As Catharine Rossi notes in her introduction to the text, “Craft offered both cultural legitimacy and a means of production to designers in the context of a rhetoric of industrialization that fell down when confronted with reality.” As we read the various designers’ views, we cannot help but notice how much geography informed their ideas about “cultural legitimacy.” What Italy or Scandinavia had to offer to international markets, for example, was entirely dependent upon their national skill bases, as much as some designers may have hated the idea. The Zodiac texts were published exactly half a century ago, but the questions they raise have never been more pressing.